To complement its more than 12,000 payment locations nationwide, the Philippine leader in the multi-platform bills payment collection business, Bayad Center, sets another breakthrough in its growing market that is now mobile. It adheres to quality standards needed in ensuring consumer’s data protection and online payment information while providing a convenient payment solution to app users. The BC mobile app has a unique system that allows users to securely make payments online without the risk of exposing one's financial information. Its user-friendly interface accepts credit card, debit card or even PayPal to settle bills. 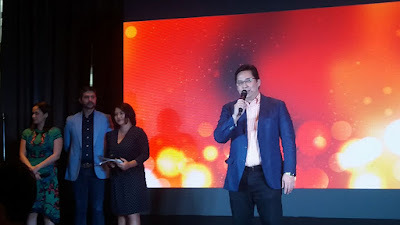 It unveiled its mobile application last March 13 at Marco Polo Hotel and introduced influential motoring journalist, blogger and TV host James Deakin and actress-model Max Eigenmann aka Judith as its brand ambassadors. “Everyone wants everything to be simple. The BC Mobile is just that. It puts together in one app all your payment needs, no bells and whistles – it sends you a reminder for your due dates, it shows you the nearest Bayad Center branches and Authorized Partners, and it allows you to pay all your bills on the fly. No need to enroll in different online payment sites, because BC Mobile carries under its umbrella the string of billing partners, and the seal of service and reliability that Bayad Center offers,” says Wendell Kristian P. Labre, CIS Bayad Center Inc’s Marketing Head. As a one-stop online shop for all your bills payment needs, Bayad Center Mobile App removes the need to fill out forms and mail bills on a monthly basis. It allows you to pay your bills anytime, anywhere using your mobile phone. Another game-changing component of the app is the Branch Locator, which allows one to find the nearest Bayad Center with just a tap away. “For most of us who are always online yet still prefer paying over-the-counter or face-to-face, the branch locator shows you the list of Bayad Center branches, authorized partners, collecting agents and automated payment machines near you,” Labre emphasizes. “Aside from its Bills Payment feature, the online app has a Bill Reminder feature to ensure that we get notified of Due Dates, helping us manage our finances better. You can easily customize the notifications based on what is most financially convenient for you,” Labre adds. Do visit www.bayadcenter.com for more information.